The following is a guest post by Steven Wastie, the CMO of Origami Logic. His epic Periodic Table of Marketing Signals guest post was one of our most popular ones this year. Video is an effective mechanism for amplifying a brand message and engaging with consumers in ways that “connect” with them. In a recent analysis we did on Rio Olympic campaigns, the brands with popular videos/commercials drove the most amplification across social platforms. However, according to a 2016 IAB Video Upfronts study on advertisers and agencies, 42% of digital marketers have trouble measuring and proving the ROI of their video campaigns. Many different platforms are being used today to publish videos. You not only have brands publishing videos on traditional platforms like YouTube but now they are posting videos natively on Facebook, Instagram, Snapchat, Twitter, and others. Measuring the effectiveness of a video campaign that spans a variety of publishers, channels and devices is not easy. The measurement and execution of digital videos are tightly dependent on each other. The goals of a video campaign and the metrics that need to be measured have a significant impact on the video format that should be used. This is not the case with most other digital mediums. Closely review how metrics are defined by publishers, especially in newer social channels. One of the downsides of having so many different video publishing platforms to choose from is that platforms are inconsistent in how they define their metrics. In fact, many of the definitions, as defined by the platform providers, are not even consistent with the industry definitions, as defined by organizations like the Interactive Advertising Bureau or the Media Rating Council. Interactive Advertising Bureau — “measurement of responses from a Web server to a page request from the user browser, which is filtered from robotic activity and error codes, and is recorded at a point as close as possible to opportunity to see the page by the user” — this definition is more aligned with traditional display. Twitter – video_total_views, which are views “at least 50% in-view for 2 seconds. This is the most in line with the MRC (Media Rating Council) standard. It is important therefore to understand how each platform defines certain terms. We all take for granted the “impression,” since it is the most ubiquitous term used in digital advertising. However, it is so important since it is the basis for how we pay for media and measure reach. Based on these publisher metric definitions, Twitter video impressions seem to be the most worthwhile since viewability is factored in. Compare video metrics and what they mean across different publishers in our Video Metrics Index. Select the video ad format that tracks the metrics you care about. Once you know your goals and the metrics you want to track for a campaign, then you need to choose an ad format. Different ad delivery tags are used to deliver different ad formats. Picking the right delivery tags is important because ad delivery tags determine which metrics can be tracked. Also make sure that publishers being considered support the appropriate ad formats/ad delivery tags and can report against them. Implement third-party viewability tracking tags and measure viewability with MRC (Media Rating Council) accredited metrics. Work with inventory partners to understand what 3rd party viewability vendors they support. Also, handshake on viewability rate expectations before launching a campaign. If you are buying from a publisher or an ad network, ask they how they prevent fraudulent traffic on their network. Establish an internal process to activate against your video metrics and campaign insights. Providing team wide visibility into important metrics like video completion rates (VCR) will bring both digital planning and creative production teams together to ensure that creatives are resonating with target audience segments. Planning teams can also use detailed metrics to course-correct and optimize/reallocate budgets across publishers to make sure marketing dollars are being spent wisely. Measuring the performance of video marketing campaigns is not easy but it is worth the effort. A key benefit of digital video is that there are more trackable user engagement metrics, like video completion rate, than other types of digital ads. This helps marketers gain a better understanding on how individual consumers are reacting to their brand message. 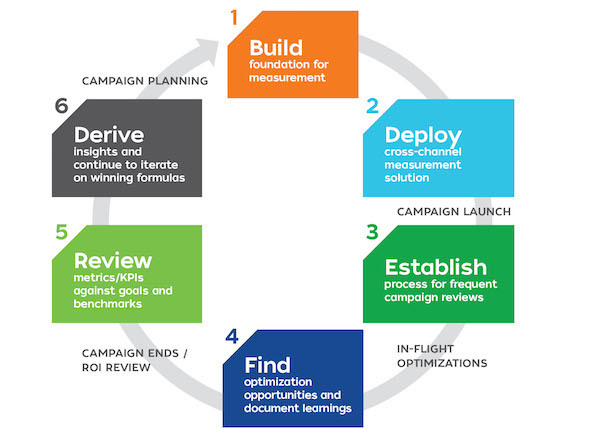 Ultimately, by measuring the right metrics and having performance benchmarks that are based on the goal of a campaign, marketers can make in-flight adjustments by updating the creatives or reallocating budget among video ad publishers. In doing so, budgets and ROI can be maximized.